We decided to go on a cruise for my wife&apos;s 60th birthday and overall, we had a blast! This is our third cruise and first time on MSC. We had a great time on this cruise, and I would definitely cruise with MSC again. The value is hard to beat! Embarkation was ok in Miami… generally smooth. We stood in line to get our cruise card (maybe 30 minutes), and then had to wait seated in a lobby… maybe an hour… until our boarding group was called. We arrived at 11am and were on board the ship by 12:30pm. (FYI… We arrived earlier than our listed boarding time.) Ship / experience: The ship is certainly beautiful… areas are kept very clean. It felt kind of "narrow" to us, perhaps just due to the sliced-up layout rather than the more open mall-like designs in some other ships. It does have one large, beautiful atrium with the famous Swarovski crystal staircases. The clubs and bars all have differing, but pleasing designs. BTW, someone complained about the bar hours, but we always could find an open bar/restaurant if needed, and the bar hours are listed in the daily planner. We snapped a photo of the schedule on our phones and were always able to find an open bar or restaurant. This is a European cruise line, there were many international passengers. We encountered a few that did not speak English, but those that did (or allowed us to attempt to communicate to them in our extremely weak German or Spanish) were very nice. We certainly encountered a couple of “ugly Americans”… and I mean in the way they acted… IE full of negativity and happy to share it whether or not you wanted to hear it! Thankfully, we had fantastic, friendly folks at our table for dinner. Gym: Adequate. I was mostly heading for the treadmills, and generally did not have a problem finding one… or if I had to wait, I didn’t have to wait long. Two of the exercise bikes were not functioning, and I think if you were heading for one of those, you probably would have had more trouble. Still, if you catch it in off hours, you’ll have less of an issue. They have a 30 minute limit on the cardio equipment. There is no running / walking track on this ship. Overall, I’d say the gym is not quite big enough for a ship this size, and with low ceilings, there is not quite enough airflow through the gym especially around the cardio machines. You have to return to your room to shower unless you get a thermal pass. Spa / Thermal Area: We played $100/person for thermal passes and really enjoyed the thermal area with multiple saunas to choose from as well as a larger steam room. (FYI… bring waterproof footwear (watersocks, sandals, flip-flops, etc) if going in the steam room; the floor is slick!) They have a great calming relaxation area with a beautiful view of the sea, and after having a good sweat, it is a great place to relax for a few minutes. We also paid for a couple’s 50 min Balinese massage. We paid $100/person + gratuity… and the massage was great! Entertainment: The entertainment was fair. Let me first say that the performers they had were super talented... excellent live singers, dancers, and acrobats, but they all performed to prerecorded music. As a musician, I really missed seeing live instruments on stage, and there just aren&apos;t enough 100%-live bands across the ship. The only regular, fully live band on the ship played in the Black and White lounge playing top 40 dance music from all eras. (Not bad, but the band simply went through the motions and they certainly didn&apos;t seem "into it.") Aside from a pianist in the atrium, and a piano/violin classical duo, most other “bands” just had a live musician or two and played against a prerecorded track... so as a musician, it pretty disappointing to me, even though all of the musicians were certainly talented. The stand out for us was Sabor Latino and with a live drummer/percussionist pair... maybe I’m just a sucker for Latin jazz. :-) Shows: This is an Italian ship / cruise line, and I&apos;m really happy to see they embrace opera, even if the crowd did not. I&apos;m not a huge opera fan but can certainly appreciate it. The at-sea mid-day opera show was a highlight for me, but was sparsely attended... the two opera singers were excellent, and they played with a pianist and violinist that were both excellent (and the only "live band" I saw in the theater). The evening opera show (an abridged version of Verdi&apos;s La Traviata) was good as well, and you could kind of gather the story from the actions on stage... but not knowing the story line, it still needed either a program guide containing translations or subtitles on the screen above. I saw most of the other shows, only missing a couple of them. Overall, the stage sets for other shows were pretty boring. The Queen show had an awful background track and IMHO, pretty weak choreography. The pirates show had great costumes and the most interesting stage set of any show, but the story line was awful. I really enjoyed the Sinatra show... the baritone was fantastic, and I thought it had good choreography. I also enjoyed the Witches of Paris show, where the acrobats where highlighted. (We only caught two shows that showcased the acrobats). Other on board activities: - In general, the daytime at-sea activities provided did not appeal to us. They mostly consisted of dance lessons, art classes (very basic stuff from our assessment), party / dance stuff in the aqua deck area. They had a napkin / towel folding event where we thought we’d get to try our hand at it, but it turned out to only be a demo which was disappointing. - Sitting by the pool is not our thing, but apparently, getting a deck chair by the pool is quite a challenge. People stake out their chair for the day. I think MSC could prohibit this practice and there&apos;d be plenty of chairs for everyone, as there were always plenty of chairs available… just with people’s stuff on them. - The water slide is blast! - We paid for a "behind the scenes" tour which was very interesting... it lasted a long time… over three hours, and other than visiting the engine room and bridge (due to security concerns), we covered much of the ship. 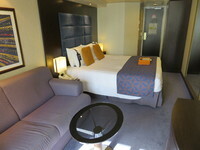 Cost was $45/person and was made through the excursions desk once on board (cannot be pre-booked). Well worth the price! Food: - We really enjoyed the food on the cruise overall. - I thought the buffet was pretty good… plenty of healthy and not-so-healthy options available. I made use of the omelet station every morning, and we overdosed on bacon as you only can at a buffet. :-) The only major flaw at the buffet I saw was that they were scrambling to refill coffee dispensers on a morning or two, and like the dining room, the service through the buffet tables was hit or miss. As others have mentioned, it was definitely very busy at peak breakfast hours, and most Europeans do not have the same sense of personal space as Americans... so some come across as being rude. Still, we were able to find a seat, eat and eat plenty, and I thought the food overall was great. - They also had prosciutto (one of my favorite cold cuts), but only on the first couple of days. - For something different, try a German breakfast… grab one of the delicious roles, some cold cuts, and a hardboiled egg. - If you want something completely different, try the Asian congee, available on only one side of the buffet for breakfast. It’s basically a rice porridge, add miso, mushrooms, onions, and fish sauce to taste; we’ve only experienced this on cruise ships and it is certainly not for everyone, but we love experiencing another culture’s foods… part of the fun of cruising!! - Being lactose intolerant, I was happy to see cheese-less pizza on the buffet. - The bread is amazing… the Europeans know how to make great bread and croissants. Take advantage while you can! - We had some great meals in the dining room. On two nights, entrées on the menu did not appeal to me, but the alternative options were excellent. I ordered the salmon one of those nights and it was great (The salmon is served nightly as one of their “always available options” on the menu.) Another night, none of the meat dishes appealed, so I ordered the vegetarian Indian dish and it too was excellent. (Note that most vegetarian main-course dishes were Indian curries and such… I suspect their other veggie curries were also great.) I only had one poor dish in the dining room, and it was a “healthy fish” option one evening. - One couple said the best food on the ship was in the sports bar, where they served wings and burgers; we personally like more variety than that, but whatever floats your boat! Restaurants: - The main dining room (Black Crab for us) service was hit and miss. The first two nights were both really slow, but they generally improved markedly afterwards for a couple of nights, but then had an off night every now and then… I’d say we had good service 50% of the time. On bad nights, it would take us 2 hours for dinner. On good nights, 1.25 – 1.5 hours… (Lunches and Breakfasts in the main dining room are much faster.) FYI… advice: only order wine when in the restaurant which is kept by the table. Grab any other drinks at the bar, and bring it into the restaurant. The restaurant took forever to serve mixed drinks. - Galaxy – sushi! On my wife’s birthday night, we enjoyed dinner at Galaxy. I thought the Sushi was very good. The price was pretty high… about what we’d pay in a sushi restaurant in the USA. Their menu / pricing was confusing with a bit of fine print explaining it all. So you can get a prix-fare multi-course dinner for $30/person, but can swap one of the options for something better at half price… they didn’t seem to mind if you swapped something similar. Neither of us like octopus, so we swapped for maki for an upcharge. The presentation was beautiful, and service was excellent, and we were surprised at how few folks were dining up there. I think the price was the deterrent… seems to me, we should be paying LESS than we would in a USA sushi restaurant, given that we’ve already paid all-inclusive rates. They could simplify the menu pricing, and just charge $25/person and I bet they’d pack the restaurant. - We thought about dining at Eataly, but heard from others that the steak house part just wasn’t that great, so chose not to go there. We hear the pizza was fantastic, but being lactose intolerant, I avoided it as well. Bars / drink package: - We read up on our “drinks on us” package – know that you do pay gratuity on your drinks, and your drink choices are limited. Search the MSC site to find detailed information about your package. I found a PDF with all the details and specifics and we knew exactly what to expect and it was exactly as stated. - I think our first formal evening, some basic drinks were free in the bar that evening… champagne, and a few mixed drinks too, including a martini. - We found a great bartender, Ryan from the Philippines, at the Silver Bar. (He is on contract with MSC for a few more months, so seek him out if you can!) That ended up being our go-to happy-hour bar before dinner. Other notes: - As others have noted, some staff, including our dinner waiter and our cabin steward, were extremely busy and did not seem to have time to be super personable / friendly with us as might occur on other cruise lines. - Accessibility of the senior staff was pretty impressive. We found a number of senior staff making themselves available throughout our cruise. - I’d encourage you to find your specific cruise on CruiseCritic and sign up for the gathering that they have on board. We spoke to the captain and others and thoroughly enjoyed chatting with the senior staff. In addition, we had a little gift of chocolate covered strawberries and champagne in our cabin the next night! Can’t guarantee you’ll have the same experience, but… Disembarkation was super smooth and fast… much faster than our last experience with Royal Caribbean two years ago in Fort Lauderdale where I think we caught customs on their lunch break! 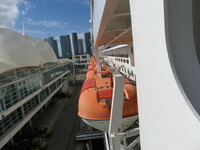 Overall, we’d definitely go on an MSC cruise again. There were definitely some hiccups, but it was obvious to us that MSC is trying very hard and they do want and listen to feedback. We decided to go on a cruise for my wife&apos;s 60th birthday and overall, we had a blast! This is our third cruise and first time on MSC. We had a great time on this cruise, and I would definitely cruise with MSC again. The value is hard to beat! The ship is certainly beautiful… areas are kept very clean. It felt kind of "narrow" to us, perhaps just due to the sliced-up layout rather than the more open mall-like designs in some other ships. It does have one large, beautiful atrium with the famous Swarovski crystal staircases. The clubs and bars all have differing, but pleasing designs. BTW, someone complained about the bar hours, but we always could find an open bar/restaurant if needed, and the bar hours are listed in the daily planner. We snapped a photo of the schedule on our phones and were always able to find an open bar or restaurant. This is a European cruise line, there were many international passengers. We encountered a few that did not speak English, but those that did (or allowed us to attempt to communicate to them in our extremely weak German or Spanish) were very nice. We certainly encountered a couple of “ugly Americans”… and I mean in the way they acted… IE full of negativity and happy to share it whether or not you wanted to hear it! Thankfully, we had fantastic, friendly folks at our table for dinner. Adequate. I was mostly heading for the treadmills, and generally did not have a problem finding one… or if I had to wait, I didn’t have to wait long. Two of the exercise bikes were not functioning, and I think if you were heading for one of those, you probably would have had more trouble. Still, if you catch it in off hours, you’ll have less of an issue. They have a 30 minute limit on the cardio equipment. There is no running / walking track on this ship. Overall, I’d say the gym is not quite big enough for a ship this size, and with low ceilings, there is not quite enough airflow through the gym especially around the cardio machines. You have to return to your room to shower unless you get a thermal pass. We played $100/person for thermal passes and really enjoyed the thermal area with multiple saunas to choose from as well as a larger steam room. (FYI… bring waterproof footwear (watersocks, sandals, flip-flops, etc) if going in the steam room; the floor is slick!) They have a great calming relaxation area with a beautiful view of the sea, and after having a good sweat, it is a great place to relax for a few minutes. We also paid for a couple’s 50 min Balinese massage. We paid $100/person + gratuity… and the massage was great! This is an Italian ship / cruise line, and I&apos;m really happy to see they embrace opera, even if the crowd did not. I&apos;m not a huge opera fan but can certainly appreciate it. The at-sea mid-day opera show was a highlight for me, but was sparsely attended... the two opera singers were excellent, and they played with a pianist and violinist that were both excellent (and the only "live band" I saw in the theater). The evening opera show (an abridged version of Verdi&apos;s La Traviata) was good as well, and you could kind of gather the story from the actions on stage... but not knowing the story line, it still needed either a program guide containing translations or subtitles on the screen above. I saw most of the other shows, only missing a couple of them. Overall, the stage sets for other shows were pretty boring. The Queen show had an awful background track and IMHO, pretty weak choreography. The pirates show had great costumes and the most interesting stage set of any show, but the story line was awful. I really enjoyed the Sinatra show... the baritone was fantastic, and I thought it had good choreography. I also enjoyed the Witches of Paris show, where the acrobats where highlighted. (We only caught two shows that showcased the acrobats). - In general, the daytime at-sea activities provided did not appeal to us. They mostly consisted of dance lessons, art classes (very basic stuff from our assessment), party / dance stuff in the aqua deck area. They had a napkin / towel folding event where we thought we’d get to try our hand at it, but it turned out to only be a demo which was disappointing. - Sitting by the pool is not our thing, but apparently, getting a deck chair by the pool is quite a challenge. People stake out their chair for the day. I think MSC could prohibit this practice and there&apos;d be plenty of chairs for everyone, as there were always plenty of chairs available… just with people’s stuff on them. - The water slide is blast! - We paid for a "behind the scenes" tour which was very interesting... it lasted a long time… over three hours, and other than visiting the engine room and bridge (due to security concerns), we covered much of the ship. Cost was $45/person and was made through the excursions desk once on board (cannot be pre-booked). Well worth the price! - We really enjoyed the food on the cruise overall. - I thought the buffet was pretty good… plenty of healthy and not-so-healthy options available. I made use of the omelet station every morning, and we overdosed on bacon as you only can at a buffet. :-) The only major flaw at the buffet I saw was that they were scrambling to refill coffee dispensers on a morning or two, and like the dining room, the service through the buffet tables was hit or miss. As others have mentioned, it was definitely very busy at peak breakfast hours, and most Europeans do not have the same sense of personal space as Americans... so some come across as being rude. Still, we were able to find a seat, eat and eat plenty, and I thought the food overall was great. - They also had prosciutto (one of my favorite cold cuts), but only on the first couple of days. - For something different, try a German breakfast… grab one of the delicious roles, some cold cuts, and a hardboiled egg. - If you want something completely different, try the Asian congee, available on only one side of the buffet for breakfast. It’s basically a rice porridge, add miso, mushrooms, onions, and fish sauce to taste; we’ve only experienced this on cruise ships and it is certainly not for everyone, but we love experiencing another culture’s foods… part of the fun of cruising!! - Being lactose intolerant, I was happy to see cheese-less pizza on the buffet. - The bread is amazing… the Europeans know how to make great bread and croissants. Take advantage while you can! - We had some great meals in the dining room. On two nights, entrées on the menu did not appeal to me, but the alternative options were excellent. I ordered the salmon one of those nights and it was great (The salmon is served nightly as one of their “always available options” on the menu.) Another night, none of the meat dishes appealed, so I ordered the vegetarian Indian dish and it too was excellent. (Note that most vegetarian main-course dishes were Indian curries and such… I suspect their other veggie curries were also great.) I only had one poor dish in the dining room, and it was a “healthy fish” option one evening. - One couple said the best food on the ship was in the sports bar, where they served wings and burgers; we personally like more variety than that, but whatever floats your boat! - The main dining room (Black Crab for us) service was hit and miss. The first two nights were both really slow, but they generally improved markedly afterwards for a couple of nights, but then had an off night every now and then… I’d say we had good service 50% of the time. On bad nights, it would take us 2 hours for dinner. On good nights, 1.25 – 1.5 hours… (Lunches and Breakfasts in the main dining room are much faster.) FYI… advice: only order wine when in the restaurant which is kept by the table. Grab any other drinks at the bar, and bring it into the restaurant. The restaurant took forever to serve mixed drinks. - Galaxy – sushi! On my wife’s birthday night, we enjoyed dinner at Galaxy. I thought the Sushi was very good. The price was pretty high… about what we’d pay in a sushi restaurant in the USA. Their menu / pricing was confusing with a bit of fine print explaining it all. So you can get a prix-fare multi-course dinner for $30/person, but can swap one of the options for something better at half price… they didn’t seem to mind if you swapped something similar. Neither of us like octopus, so we swapped for maki for an upcharge. The presentation was beautiful, and service was excellent, and we were surprised at how few folks were dining up there. I think the price was the deterrent… seems to me, we should be paying LESS than we would in a USA sushi restaurant, given that we’ve already paid all-inclusive rates. They could simplify the menu pricing, and just charge $25/person and I bet they’d pack the restaurant. - We thought about dining at Eataly, but heard from others that the steak house part just wasn’t that great, so chose not to go there. We hear the pizza was fantastic, but being lactose intolerant, I avoided it as well. - We read up on our “drinks on us” package – know that you do pay gratuity on your drinks, and your drink choices are limited. Search the MSC site to find detailed information about your package. I found a PDF with all the details and specifics and we knew exactly what to expect and it was exactly as stated. - I think our first formal evening, some basic drinks were free in the bar that evening… champagne, and a few mixed drinks too, including a martini. - We found a great bartender, Ryan from the Philippines, at the Silver Bar. (He is on contract with MSC for a few more months, so seek him out if you can!) That ended up being our go-to happy-hour bar before dinner. - As others have noted, some staff, including our dinner waiter and our cabin steward, were extremely busy and did not seem to have time to be super personable / friendly with us as might occur on other cruise lines. - Accessibility of the senior staff was pretty impressive. We found a number of senior staff making themselves available throughout our cruise. Disembarkation was super smooth and fast… much faster than our last experience with Royal Caribbean two years ago in Fort Lauderdale where I think we caught customs on their lunch break! 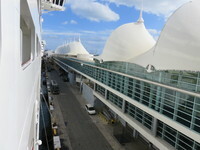 Overall, we’d definitely go on an MSC cruise again. There were definitely some hiccups, but it was obvious to us that MSC is trying very hard and they do want and listen to feedback. The highlight of staying in the cabin is sound of the boat cutting through the water and the waves hitting the boat. Sooo relaxing to open the door on days with cooler weather and enjoy the ocean sounds from the bed or sofa! I really enjoyed being towards the front of the ship… no vibrations from the engine / props, just a gentle rock and sway. Note that this particular cabin does not have glass with a view of the sea from deck chairs… IE you can’t see the sea while sitting down. You have to stand up and look out a large metal open “window”. (I’m sure this is because it on a lower deck, towards the front, and closer to the sea.) 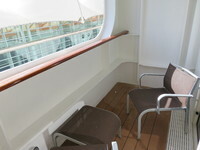 This set up also made the cabin’s balcony extremely private. AS for the interior, it worked just fine for us. The bed and sofa were reversed from a previous cruise we took. Having the sofa near the balcony door was nicer than having the sofa at the interior of the room. 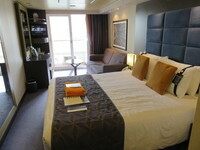 The steward kept our room very clean, and the layout was compact and very functional. Overall, we were happy with this cabin. We were lucky enough to have a personal connection with a bicycle shop on the island and had an awesome tour of Aruba with the owners of Tri-Bike Aruba. Super nice folks. It was definitely hot for someone coming from Colorado, but beautiful desert environment with great terrain for mountain biking. The only annoyance was the ATVs racing close to shore. We had a personal tour with friends staying on the island. Fantastic snorkeling available directly from shore was the best part of Bonaire! We took a taxi ride on Cozumel to get an overview of the island. There are some beautiful beaches and rocky coasts where you can see the blue water waves crashing into the rocks. The tour was okay, but mostly the driver talked about all the resorts we drove by. We did get to see a senote and an crocodile which was neat. We enjoyed having lunch again at a scuba resort called Blue Angel near the Puerta Maya cruise terminal (the one away from town). Aquarium was great, and the dolphin show was fun to watch. You can also go into a submerged boat to watch a "feeding" with sharks and other fish. Enjoyed walking around town and seeing the floating bridge that swings out of the way for large ships entering the harbor. Interesting places to shop all through Willemstad. We took one of their cheap "buses" to the Aquarium. The bus system is pretty strange... did not seem to have a set route, other than a few specific stops. IE it seems it would wander off route to drop folks off at times. But we got there and we got back without any issue. If we return again, we&apos;d like to visit one of the historic forts and read up more on the history of the island. Bobsled at Mystic Mountain was fun. We had to wait in a pretty long line to get on the bobsled. It was basically a roller coaster, but with brakes so you can control your speed. Neat to race through the beautiful rain forest. Chairlift at Mystic Mountain was pretty basic ride up through and above the canopy with nice views of the shore / island. The chairs heading up end up directly above the chairs heading down. Coming from Colorado, I had never seen that arrangement. At the top, you can start your zipline or bobsled. They also had a pool/waterslide/restaurant and performers (drummers/dancers) at the top, along with a gift shop. If you do the zipline, you&apos;ll end at a mid-way down-loading point on the chairlift where you take it down and get your ride back to your hotel/town/cruise ship. The chairlift was basically your mode of transport around Mystic Mountain. Total blast zip lining at Mystic Mountain. The tour guides were amazing, but you definitely had to have a sense of humor... as you left the platform, they liked to scream out... "wait, wait!" as if they had forgotten something really important. You end your trip going down the chairlift.